As promised, here is my video recipe of the ubiquitous California Roll. Thank God (Buddha, in this case), for the user-friendly crab and avocado roll, as it allows those culinary cowards among us to join friends at a sushi bar. Without it they would have to make up some story about a sudden illness in order to avoid the embarrassment of admitting to raw fish phobia. Since I couldn't find the official term for this horrible affliction, I found a Latin-English translation site and have now coined this syndrome, rudispiscisphobia. I was hoping to also show some raw fish options using the sushi rice, but there was no decent "sushi-grade" fish readily available in my neighborhood. Maybe next time. 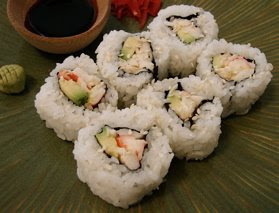 The faux crab I used in these California rolls is a nice option if your budget (as I very subtly joke about in the clip) does not allow for the real stuff. Just be sure to check the labels and make sure your fake crab is made from real fish. Enjoy! So this is you "roll"! I spent a year in Japan and learned to eat all kinds of sushi rice goodies. Love it! Thanks for this post. Her is my translation of "You can do it!" It actually reads, "It is possible to do that!" and looks like this: それをすることができる! Try to say: Sore o suru koto ga dekiru! Ah, so! That's how it's done! A less bookish term would be 'allergy'. That's what I have, anyway. well allergy is a completely different situation. You can't eat raw sushi, but aren't afraid of it. You rock Chef nd I got it! I will donate what I can when payday 'rolls' around! You are well worth it! Like the rapper Nelly once said,"I was just kidding...unless you're going to do it." Chef John, it's been a pleasure to watch your cooking demos: I've watched every video that you posted here! I wish that I could donate more. How about more ethnic foods like Indian, South Asian, Thai or Vietnamese? Thanks for the video (I could finally tell my friends to make Sushi on their own) and thanks for the reminder. ;) I've donated what I had on my Paypal account. It's nice how they automatically convert currency now. i hope you don't disable this comment but, as a chef i would think you would be able to make better sushi. that is a horrible showing of homemade sushi as you have put too much rice. also, do california rolls not include avocado and cucumber? Horrible? I don't think it would win any awards, but I'm not sure it was horrible. This demo was for someone that has no idea how a sushi roll is made. More rice is easier than less IMO. And, I like rice. True, many CA rolls have cucumber. I don't like it with cucumber. Lastly, I don't know why you would think I wouldn't post your comment. If I didn't I wouldn't have had the chance to call you a jerk. Jerk. What kind of person would go out of their way to insult someone who is doing a great service by teaching beginners some basic cooking skills. Keep up the great work Chef John! thanks. what was most annoying was that they were right! Thanks for posting this. I think it looked just as good as the ones you buy from the grocery store for $8. I just bought the stuff and I am going to make this. I will post a picture on my blog when I am done. Someone always has to be a critic, the ones that never make videos are the worst. I made the sushi rolls. I put a picture of it on my blog so you can go see it if you want to. They were a little hard to make. But they tasted good. I will have to practice more. Yours look great compared to mine. I put a link to your video so people can see yours. I believe you're missing the third ingredient in a California roll: cucumber. Hey thanks for this video! It's so much easier to watch how its done than looking at confusing pictures. But, I was wondering if there was a proper way to store the rice/sushi for a later time? Like if you wanted to make it the night before and take it to work for lunch the next day? Also you should make a video on Rice Balls! They are delicious! the rolls will last over night, uncut in plastic wrap. Had my first taste of sushi this weekend, with more to come. Please post more like this! PS. If you know of a great Pad Thai and Kow Pad recipe that would be awesome!! I have tried many different recipes and none of them compare to what you find at Thai restaurants. I am sad to see that a person who called himself or herself a chef had such a strong negative comment. That person let his or her issues get in their way in seeing what a great service you have provided for many. I lived in Japan for 2 years and I make my own sushi. Your technique was fine. I love trout. The only trout I've eaten is what I've caught. I usually cook it whole. Can you show us (me) how to filet one to open up like the ones you showed? I love all your videos. Very easy to learn for a short amount of cooking time. I am your new fan. I love to cook for my husband and kids, but never knew how simple some ingredients can be! I always wanted to buy many seasonings and dry herbs, but just doesn't know how to mix the flavor. I put it back on the shelf, but no more! Thank you very much for the ideas. Happy New Year. Oh John, you make it look so easy. Why do my rolls always seem to wind up crumbling into a big mess when I try to cut into them? Well, I recently discovered the using my biggest, sharpest knife wasn't doing me any favors. It would cut through the rice fine, but it would get stuck on the nori and botch the roll. Instead, a serrated bread knife seems to actually work the best. Sure, it's not how they do it in real Japanese restaurants, but at least my rolls come out semi-respectable looking! Hey Chef John, what happened to the sushi rice video? I cant find it on the blog or on youtube. That was one I did for About.com. They must have pulled it. Check their site. Thanks Chef John! My husband and I love your recipe videos. We've recreated your Thanksgiving recipes (your voice is often heard most of the time we're in the kitchen), boiling eggs, deviled eggs, pretzels and many more. Can't wait to try these!